A.Monntoya’s paintings represent all the beauty projecting from the principle figure with colour. Painting is a way of expression, a constant internal search and from the moment I began to paint I have used several landscapes of colour. At first I expressed myself with the typical colouring of a tropical climate, then I was plunged into the chaos of not knowing where to go, I was inside a world of greys and from that basis I have been giving way to the warmth, the colours and the shapes that I show today. I wish to show an everyday moment in a sweet manner, which is natural and full of passion and sensuality. From a personal view point I also look for the merging of two energies, two opposites, two forces, the good and the bad, light and darkness, which when united, create a balance, a balance that gives way to shapes and spaces thus allowing you to glance at an instant of feelings and beauty. Alexandre Montoya was born on the 16th of January 1974, Roldadillo (Valle), Columbia. He studied the fundamental concepts of drawing perspectives at INEM, in the city of Pereira where he graduated as an Industrial Graduate. In 1994 he opened a small gallery in the city of Cali. He began to be more involved in his drawings when he had more contact with other artists in this region. Each day he felt more motivated to paint. Alexandre says, it was because he knew that he had a gift with the paint brush and his heart swelled with happiness and peace when he was painting night after night. Alexandre participated in some exhibitions and when he was 24 years old he won first prize of "Young Artist of the Year" in his region Vallecaucano, Columbia. 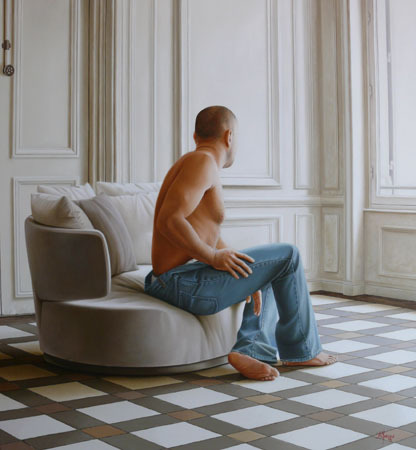 In 2001 he decided to close his gallery in Columbia and move to Spain to grow and develop his work as an artist. There were some difficult times, a period of time went by that he was conscious that in order to succeed and make history he had to change and develop his style of work, so as he desires, he can be one of the greatest painters of our time.